Welcome back or hello if you are new to the Flying Pincushion. This week's theme is the movie Willow. If you haven't seen it then you've done yourself a disservice. This movie is consistently in my top three favorite movies list (along with Episode V and The Princess Bride). This is a movie that has just about everything for the tabletop gaming writer. Love, magic, swords, unlikely- and anti- heros, a damsel in distress (who can cause distress), and a spectacularly memorable big bad evil to defeat (Bavmorda) are all part of this movie. 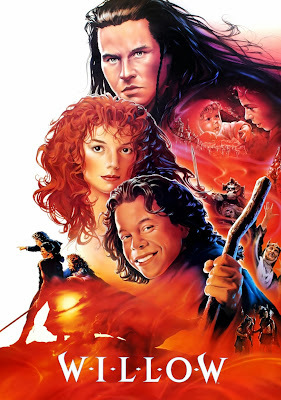 Val Kilmer as Madmartigen, Warwick Davis as Willow, Kevin Pollak as Rool, and pretty much the entire cast all splash excellence on the screen. There are humble beginnings, the hero's quest, monsters, and an epic final battle in which good prevails. So how on earth do we narrow down our ideas? One question I constantly ask myself, “What do I currently feel like writing?” In this case, a monster seems like a good challenge to undertake. I don't normally stat up many creatures because I really have to be interested in the concept to take the time and effort. As an example, I recently wrote up mythic leukodaemon for a play test of the mythic rules that Paizo released (OK so it wasn't too recently). I loved the concept because the creature was a lieutenant, albeit a low ranking one, to one of the Four Horsemen. He also had an ability I wrote that allowed him to take on a creature's class and abilities when he wore their freshly emancipated skull in place of the leukodaemon's normal skull. So I've made my choice to write a monster for this theme. What can I tap into from Willow that would make for a memorable creature and encounter? Should I choose the Eborsisk that spawns in water? Could be fun, but I think we can dig deeper. Could the disgusting trolls be a viable option? They don't really need to be statted up again. How about one of the brownies? While I do love fey, the brownies already have a place in almost any gaming system. This is getting tough. Either it seems we are running into too direct of a choice or there are loads of the same monsters already existing in the gaming world. How about that scene during the final confrontation between Willow and Bavmorda? You know the urn on legs that gets struck by an errant bolt of magic and then comes to life? Now that feels satisfying. That is an interesting creature concept I can get behind that also doesn't have many analogues (aside from animate object type spell effects). If I add a little twist to make it my own creation then we're in business! Alright then, I've got a monster concept after picking a scene from the many excellent scenes in the movie; a living urn that attacks folks upon activation. Now maybe that is my twist, that it is already a living urn but only comes to life when activated with magic. Just maybe, that twist can be any magic that catches it in the spell's effects. I think I've got an idea now, a living urn that is brought to life for a short period of time when it comes in contact with any spell's effect(s). We need a name for this bad boy. Spell Pot (maybe). Magical Feeder (this doesn't really make any sense). Living Ossuary (bingo!). What you didn't see happen here on the page is that I went and did a good synonym search on the word urn. Ossuary came up and, according to Merriam-Webster’s; it means "a depository for the bones of the dead". That just oozes flavor and a Living Ossuary would fit the bill quite nicely. Now it is time to think up a little introductory paragraph. Seems like a good start since we have a description of what it looks like while catatonic, what activates it, and what it looks like after activation. How hard should this creature for an average party to defeat? In all likelihood, the living ossuary will be a type of caryatid column. 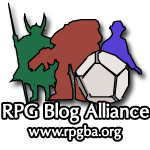 Going back and reading the beginning description of the caryatid column on Paizo’s PRD makes me look back at my own description. I think I should revise that description now. That feels better as it is more concise and doesn’t give away too much of the creature on the get-go. Looking again, the caryatid column is a CR3 creature with some interesting effects when it comes into contact with magic. CR3 seems like a good place for a living ossuary to be because I envision this creature is something that a big baddy would have around but is easily controlled by the big baddy. Having made this decision, I will construct the monster entry by basing it off the caryatid column stats and tweaking a few things to fit what I envision. Innocuous and utilitarian looking, this heavy urn is held three feet off the ground by three black, wrought iron legs. Catatonic (Ex) A living ossuary is considered to be under the effects of a sleep spell until they are subjected to any magical effect. Once activated in this manner, a living ossuary remains active until destroyed or all living creatures within its blindsight range are killed. Living ossuaries cannot be identified as living creatures until it is activated or studied for 3 rounds with detect magic. Magic Eater (Ex) A living ossuary absorbs any 2nd level or lower spell. When a spell is absorbed the DR of the living ossuary increases by the spell’s level. Three-Legged (Ex) A living ossuary is built as a tripod and suffers a -2 to its CMD against trip attacks. Living ossuaries are variants of caryatid columns and are created by spellcasters to guard the entry into a room used for arcane magic rituals. Like caryatid columns, living ossuaries cannot be made into shield guardians, but they are often used in greater numbers because of their relatively inexpensive creation cost and functionality in arcane rituals. Living ossuaries have no programming regarding what area to guard or whom to ignore, rather they attack anyone in the range of their blindsight. Invisibility has no effect on a living ossuary’s detection of a creature. A living ossuary stands 3 feet tall and weighs 350 pounds. Any items placed inside the lid of a living ossuary can be taken when they are inactive or destroyed. A living ossuary is made from wrought iron and brass weighing 350 pounds in total and costing 1,000 gp in total. There we have it! We fully created a construct based on the urn that came alive from an errant bolt of magic in the movie Willow. I will leave it to you, the reader, to look at the differences in the stat block between the caryatid column on Paizo’s PRD and this living ossuary. Leave any questions (or anything at all!) in the comments and I would be more than happy to answer you. Until next installment, in which I find an idea from Gilgamesh, have a great week.